We are dedicated to this wonderful breed and our mission is to raise the very best dogs of superior temperament and outstanding conformation. We enjoy interacting with other Giant owners and have been fortunate to have great mentors who are long time devotees to the breed. We have several years of experience in training (Schutzhund), showing and breeding with large breeds. Now, we want to pass along our experience and help newcomers find the Giant of their dreams as well as educate them with all the information needed to make Giant ownership a great experience. New to Giants? Giants are very large and strong dogs, who thrive on demanding athletic activities. They enjoy running, swimming or to get involved in the various competitive dog activities including agility, obedience, carting, or tracking. They are high-energy, boisterous and stubborn. They require a confident owner who can take charge when necessary. For those who are looking for show-quality puppies, Aziara Giants have proven lines going back 45 years to the 1st American-bred Best in Show Male (Ch. El Lobo Emo) and Female (Ch. El Lobo Nina v Emo) Giant Schnauzer. The breed is known to be protective, yet gentle and loving. They are quick to learn and good training is always welcome - they aim to please. 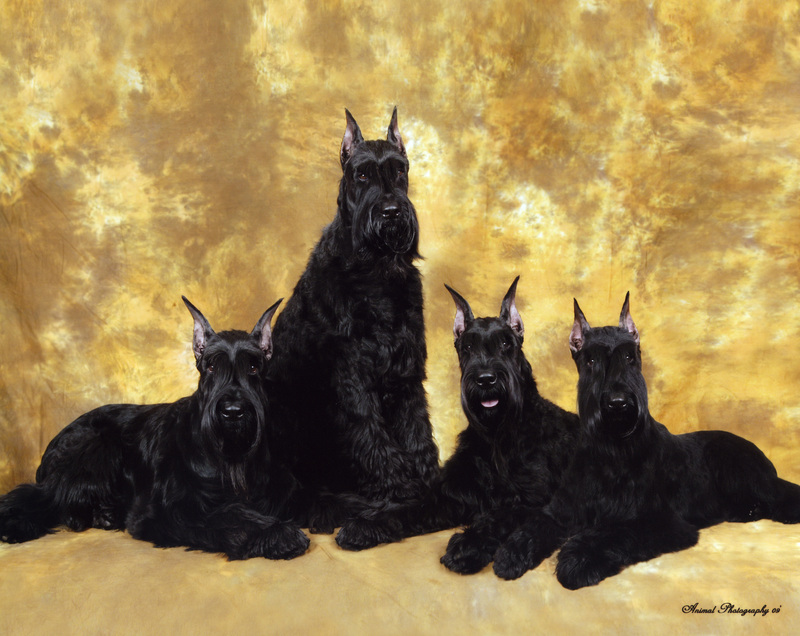 The Giant's coat comes in 3 variations, a coarse German-style coat, a softer American coat and a Medium coat, which is something inbetween. A certain amount of grooming is required to maintain the striking beard, eyebrows and furnishings that make any Schnauzer so distinctive. We look forward spending the rest of our lives loving and working with this amazing and majestic breed. Please take your time and discover the Aziara Giants story, visit the family gallery and puppy photo pages.